Henry “Harry” Power (3rd grt uncle) his mother Anna “Ann” (McGuire/McGuier) my 3rd grt grandmother from her marriage in 1824 to Jacobus (James Malanaphy) in Dec 1824, Enniskillen, County Fermanagh. My 2nd great grandmother Ellen “aka Helen (Malanaphy) Sturgess was one of Anna’s four children who accompanied her on the convict ship “Mexborough” in Dec 1841 to Tasmania. Anna a widow confessed to the crime of stealing chooks from her employer (a crime she committed prior to her marriage to Jacobus (James) Malanaphy) and for this crime she was transported to Van Dieman’s Land (Tasmania). The three girls – Ann 13 yrs old; Margaret 11 yrs and Ellen (my 2nd grt grandmother) 7 yrs old. Their brother Patrick Malanaphy was 10 yrs old. On arrival Ann was sent to the Female Factory and her children admitted to the Queens Orphan School. Ann remarried in July 1844 at St Josephs Catholic Church, Hobart Town, to William Pickburn (“aka Pitman” – for his occupation). The three girls all married but unfortunately, Patrick never married and was killed at Spring Gulley, Victoria in a mining accident in October 1860. 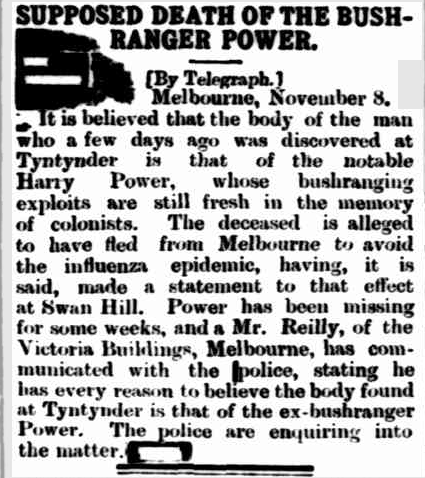 The relative that Henry “Harry” Power kept in contact with that we are aware of was his step-sister Margaret – she married Reuben (“aka Lubin”) Slater ,and her family they lived in Oakleigh, Victoria. From Anna’s death certificate we learn’t that Henry “Harry” was not her only Power son their were possibly two older sons. Of the Power boys father we have no idea. This man used a number of alias during his lifetime and it is strongly suspected Power was not his real name. William as far as we his known family are aware he used the alias Henry “Johnson” when he was transported to Van Dieman’s land aboard the “Isabella” arriving in Hobart Town on 21 May 1842.